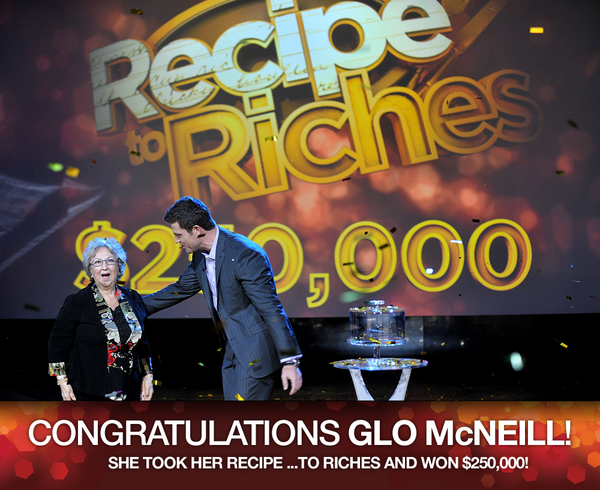 Who Won The Recipes To Riches $250,000 Grand Prize? [twitter]Recipes to Riches is a Food Network Canada show that featured home chefs from across Canada sharing their own unique recipes in 7 categories. Hosted by former Bachelor contestant (and NFL quarterback), Jesse Palmer, the show also featured judges Laura Calder (chef), Tony Chapman (marketing), Dana MacCauley (food) and Galen Weston (Loblaw). Each week a winner was chosen to receive $25 000 and have their item sold in stores across the country. At the end of the series, each previous winner was then up for a $250 000 grand prize. Glo McNeill’s Luscious Lemon Pudding Cakes! Glo is a grandmother from Lunenburg, Nova Scotia with a passion for the arts. She’s an avid painter, poet and barbershop singer. She’s shared her love of food by publishing The McNeill Family Cookbook (just for family) to keep family recipes alive. What a sweet lady and a deserving winner. She was the first finalist from the first episode and everyone cheered her on right from the start. Even though I liked the Slow and Low BBQ Pork and the Kulfi Karma Ice Cream, this was a brilliant choice as winner. The lemon custard-y pudding has the perfect tart / sweet balance and the biscuit topping is soft. Now .. good luck finding it in the stores, Glo McNeill’s Luscious Lemon Pudding Cakes have been sold out each week I’ve gone to look! Congratulations to all the weekly winners. Having a family member’s face on grocery store shelves, I can speak to what a thrill it is to win a contest like this. I can’t wait for season 2! Disclosure: I am not sponsored by President’s Choice or Loblaw. I just think this was a damn fine tv show idea that deserves publicity! I wonder why the woman from Whisteler B.C. was not shown as one to vote for. She won week 5, yet we couldn’t vote for her Gluten Free Cookies. Sent message to the program site and NEVER got an anawer. Come on Galen Let us in on the big SECRET. She had (distant) family involved with one of the participating companies and was disqualified.